I bought my white whale card of the current the other day off eBay. 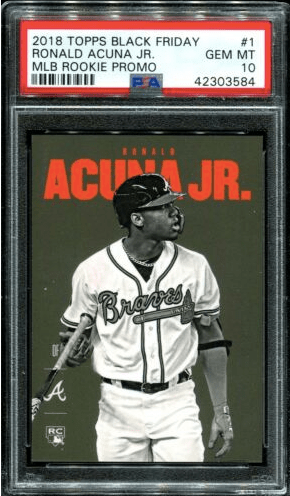 The 2018 Topps Black Friday Ronald Acuna card, it’s the only one on the PSA regsitry right now graded ’10’. Pretty happy with this slab buy. Acuna is one of those generational talents, obviously at the surface. Like a Mike Trout – if he does well this season – stuff like this with some rarity should continue to rise in value. I’ll continue to post some of my slab buys from the week each weekend on ‘Slab Sunday’ or ‘Slab Saturday’.